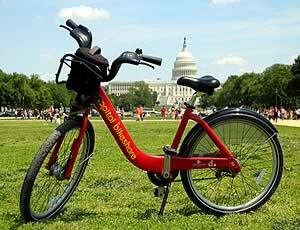 MCDOT’s Bikeshare program will soon expand the Washington Region’s existing Capital Bikeshare program to many locations in Montgomery County. Grants from the Maryland Department of Transportation, and the Federal Transit Administration, together with County funding and contributions from developers and the City of Rockville are providing the seeds for Bikeshare in Montgomery County. Special focus: part of a pilot program to extend BikeShare to lower income workers commuting to work or education and training. I wonder if Reston Town Center (the corporate entity) might be interested in getting behind Fairfax Bike Share...or maybe one of the other big dollar companies located in the RTC. It would get their sponsorship logo out wherever the bikes travel.